Item is a photograph of assorted artifacts displayed on a light box. Item is a photograph of the back of a riveted Faiene polychrome bowl. 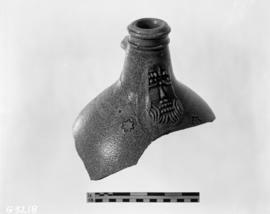 Item is a photograph of the back view of a cew pitcher, with interior clear lead glaze and an outer green lead glaze that extends halfway down the exterior. Item is a photograph of a beam support found at the Fortress of Louisbourg site. Item is a photograph of the bottom of a bottle, with a makers mark saying "Made in Canada." 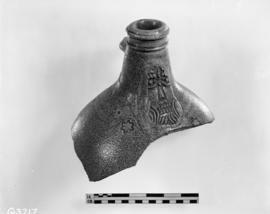 Item is a photograph of brackets found at the Fortress of Louisbourg site. Item is a photograph of mixed brackets found at the Fortress of Louisbourg National Historic Site. Item is a phtoograph of the skull found in burial 2. Item is a photograph of a pig's tooth found in burial 5.